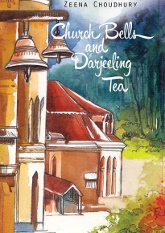 Church Bells and Darjeeling Tea tells a story from a different era, of different lives. It’s a tale of a ten year long stay in a land filled with shivering mist and dense clouds… the land of Orange Pekeo Lopchu Tea, Toy Train and the Kanchenjunga ― Darjeeling! Zeena Choudhury recollects the time she spent in Loreto Convent Darjeeling. Her journey as a ‘Loreto Girl’ began at a time when the Indian subcontinent was experiencing a significant political shift that would eventually leave a traumatic scar on the combined consciousness its people. Despite that the jovial child that still plays inside the author’s heart makes the red rhododendrons, green tea gardens and the glowing snow covered Kanchejungha at dawn burst with vivid colors in the reader’s imagination. Church Bells and Darjeeling Tea is indeed a tale of innocence.